In an earlier issue (HRJ Vol. I., No. 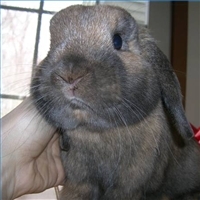 5), we covered basic rabbit vocabulary-the body language, actions, and vocalizations that will help you receive essential information, such as pet me; don’t even think about petting me; get out of my way; I love/lust you; etc. Now we move on to deeper levels. These are messages whose content is more emotional than informational. I learned them initially by watching rabbits communicate with each other. When a rabbit talks with me in this way, I feel deeply honored. Regardless of whether she’s saying “Buzz off” or “Groom me,” the underlying message is she’s treating me as if I were a fellow rabbit. She’s graciously overlooking my unwieldy size and clumsiness and my tendency to fill a perfectly good silence with insipid baby talk. A friendly rabbit will often sit still or even trance-out when you pet him. When you stop, within a minute or so, he may rouse himself and either hop away or demand more strokes. If you start petting he may settle down again. But if you live with two or more rabbits, you will notice that they spend a great deal of time sitting close- side by side, head to head, or draped across each other. A rabbit who settles in for a good long zazen beside you, without the enticement of petting or treats, is communicating in Deep Rabbit. If he’ll snuggle next to your face, you’ll get the full honorary-rabbit experience because you will be able to hear all the woofling and snuffling of his breath and smell his fur. Another rabbit-to-rabbit interaction is grooming. A bunny who licks and nibbles you is showing deep affection. If Flopsy takes on the awesome task of grooming a human head of hair, she is bestowing the high compliment of treating you like a rabbit. My friend Carol’s bunny, Simon, likes to lie beside her in bed. One evening Carol was reading in bed, feeling the warm pressure of Simon against her arm. She glanced over at her (yes, Simon is a she) to find Simon on her back, feet straight up in the air, brain in the ozone. Would you surrender your consciousness so completely to a member of another species who outweighed you by 100+ pounds? Play behaviors in animals (humans included) have several functions. One is for youngsters to practice skills they will need as adults. Kittens’ primary games are Chase it, Catch it, and Kill it. Bunnies, being low on the food chain, play Elude the Captor, as well as Court the Potential Mate, and a variety of King (or Queen) of the Warren games. Thumper may invite you to chase him by zooming up to you, nipping or nudging your ankle, then racing off with a sassy switching of his tail. He may further entice you by shaking his head. It’s easy to miss gestures of trust from a shy or aloof rabbit. Even friendly, confident bunnies are usually more subtle than cats. A timid rabbit may make a first step toward friendship simply by going about the business of being a rabbit in your presence-in effect, by ignoring you. This may not sound like much, from a human point of view, but it’s a great effort for her to switch from ready-to-run to a more relaxed, peaceful state. Although our house rabbits have been domesticated for over 500 years, they are still basically designed to respond quickly to all the information coming through their ears, nose, eyes, and whiskers. These are a few of the components in the vocabulary of deep friendship. It is one of the greatest rewards of fostering, especially since these gifts of trust are so often given by my “hospice rabbits.” These are the ones who arrive paralyzed or starving, abused or neglected but with their great spirit intact. More than any overt behavior or action, the status of Honorary Rabbit is a feeling, unmistakable, from her heart to yours.